Tired Of Small Fields Anyone? It is getting tougher and tougher to make a score at the track. There are many reasons why, but number one is, without a doubt, the seemingly never ending parade of races with 4-7 betting interests in them. Whether you make horizontal or vertical wagers, short fields limit value and limit how much you can win. Yet these races are subject to the exact same takeout (which varies from track to track) as races with double or sometimes triple the field size. 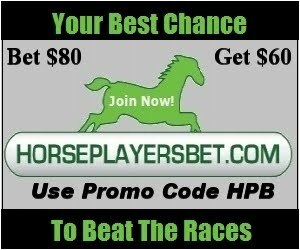 What makes things worse is with 10 cent and 20 cent superfectas (which generally have the highest takeouts) available in 7 and sometimes 6 or even 5 horse races, Horseplayers unwittingly get sucked in because these bets offer the best payout prices despite the higher takeout. The result is less churn, which means Horseplayers go broke quicker. For example, an exactor pool that has $20,000 in it with a takeout of 20% returns $16,000 to the bettors collectively, but a superfecta with the same pool size and a 25% takeout, returns only $15,000. The reality is that many $2 exactors payout around the same as a 20 cent super on average. It seems that no matter which track you handicap these days, short fields are prevalent. Horsemen like them, because there are less horses to beat. But pool size suffers the shorter the field. From a business perspective, it makes more sense to pay higher purses to horses that beat more rivals, and the more horses the more betting dollars, the more the track and horsemen receive from betting. Maybe if tracks adopted this type of mentality, horsemen wouldn't shop around for short field races so much. Maybe horses would race a little bit more as well because more participants would not get a check for just running around the track. What I find most troubling about these short fields is that almost every short field race has at least one or two horses off over a month. From a handicapping perspective, it makes for more of a guessing game, one that doesn't add value, but makes the race too unpredictable in light of a high takeout rate. One needs to be right a lot more in shorter field size races because payoffs are smaller, and guessing if a horse was off due to soreness or because the trainer aimed for this race creates too many mixed results which destroy one's bankroll in a hurry. I realize there is more going on when it comes to lower field size. The recession in 2009 and the overall downturn of horse racing has knocked out the race horse population and the participants in the industry as well has reduced in size. Field size has also been victimized by the backstretch drug culture. Horses are too drained to race frequently, like they did in the 40's through the 70's. Now horses only have a few races to get ready for a year, whether they run for 10,000 or in Stake Races. It is more important that they are ready for those races, so many are fine tuned with the best legal and best non detectable drugs available. And I can't stand the Lasix apologists. It is blatantly obvious that horses have made less starts per year ever since Lasix was made legal. It is also a known fact that Lasix drains most horses and significant weight fluctuations occur. For the good of the game, a quick simple rule. A horse cannot go to the breeding shed until they hit 5 (I prefer 6, but 5 is realistic). This will also give the public more of a chance to get to know good horses. The longer their career, the more they become familiar to the mainstream public. For example, the media will mention California Chrome's next race, and if he keeps winning, he'll keep getting mentioned, and if he were to stay on for another year, and kept being competitive, more potential fans and eventually long term Horseplayers may be created. Also for the good of the game, a Triple Crown for 4 year olds and up should be created. Lets have 3 one million dollar plus races starting in July and ending in August. It can even be the same distances as the three year old Triple Crown events. This should give incentive to owners to keep their horses going longer even if they put up a fight over the 5 year old minimum breeding shed age. It may create horses that are bred for stamina and longevity, that the public can familiarize with, and not some shooting star that puts the smile on the face of a pinhooker. Like a B movie monster who, without a doubt, dies for sure at the end of a sequel, Fort Erie Race Track is back from the dead for at least another year. But without a 5 year contract, Fort Erie has a lot of eyes on it this year, and some of those eyes could be determining if the track has a viable future or not. It couldn't be a worse year to be judged. Not only the Liberal government's action a few years back decimate the horse racing industry, it did a number on the horse population in Ontario. Between that and the US recession in 2009 and slow recovery which affected breeding, field size is getting clobbered all over North America this year. Bettors, big and small, are becoming more selective and there has never been more awareness when it comes to track takeout. The current Horseplayer boycott of Churchill Downs, which followed Churchill Downs takeout increase, is evidence that there is a pretty large population of gamblers who are mad as hell and not willing to take it anymore. It is more important than ever to cater to the current Horseplayer's needs while hoping that growth can occur, instead of taking the CDI approach of being a big dog while treating the customer as if they were a fire hydrant. Grabbing more of a shrinking pie, just because you can, will only make the pie shrink more, and that has been happening at an accelerated pace lately in the industry. If the end game is to have two or three tracks in North America, and many casinos that used to be Racinos, what the industry is doing is just fine and dandy, but there won't be much of an industry left. And this means a ton of lost jobs. That brings us back to Fort Erie. If thoroughbred horse racing is to grow in Ontario, a B track is needed. It has to be somewhat viable though. Yesterday (Sunday), with very short fields, Fort Erie was only able to do $275,000 in total handle. Even if field size was slightly larger, I don't think the handle results would be much larger. Problem is that the overall customer base is shrinking in North America, and competing with A tracks, is not the way to go. Sundays might attract a slightly higher live crowd, but in a town like Fort Erie, which is full of shift workers and the self employed, Sundays are very close to the Twilight Tuesday crowd when it comes to the available market of potential Horseplayers in the area. Fort Erie can only afford to race twice a week, they need to attempt to maximize their potential. Looking at a schedule of thoroughbred racing in North America, it makes a lot more sense to have a 2:30 or 3:00 post time on Wednesday instead of racing Sunday. There will be a natural feed into Woodbine's Wednesday night card, so revenues made on other tracks shouldn't take a nosedive either. And moving the Farmer's Market to either Tuesday or Wednesday Twilight shouldn't be a big issue. In fact, they can still run with that on Sunday if they think it attracts bettors. There are plenty of A tracks to play that day. The other thing Fort Erie desperately needs to do is to reduce takeout on exactors and daily doubles to Woodbine levels (and to help makeup for any short term loss, it would be wise for Fort Erie to add rolling doubles). This will automatically put Fort Erie on the radar screen of price sensitive players everywhere, and of course, by putting a little more into the pockets of live players, the potential for them to bet it back and even come back to the track increases (and you have a growth component). Handle increases begets even higher handle. It is pretty much a gimme that HANA (The Horseplayer's Association of North America) and Social Media will help put Fort Erie on the map if these takeout reductions occur. But if they stick with a 26.2% takeout on doubles and exactors, combined with really short fields, Fort Erie is destined to have a very bad year in handle and they better hope they are not being graded by those handle numbers. Over 10 years ago, when Fort Erie was swimming in slots money, and horsemen who actually had extra on them to wager, they toyed with Friday racing. For various reasons, it didn't do well. But things have changed, with less people going to the tracks these days. It is delusional to believe people are going to come back to the track. This means, Fort Erie's main competition are the tracks that race when Fort Erie races. Being a B track, they can't afford to compete at Prime Time with more than one or two A tracks tops, and they need to add some value to attract some of the betting crowd who have forgot they exist. An independent track can make it. They have the ability to be more versatile and creative. This only comes into play, of course, if they make things happen instead of watch things happen, or even worse, at the end of the day, say "what happened."